Once upon a time in a great castle, a Prince's daughter grew up happy and contented, in spite of a jealous stepmother. She was very pretty, with blue eyes and long black hair. Her skin was delicate and fair, and so she was called Snow White. Though her stepmother was a wicked woman, she too was very beautiful, and a magic mirror told her this every day, whenever she asked it. "Mirror, mirror on the wall, who is the loveliest lady in the land?" The reply was always; "You are, your Majesty," until the dreadful day when she heard it say, "Snow White is the loveliest in the land." The stepmother was furious and, wild with jealousy, began plotting to get rid of her. Calling one of her servants, she bribed him with a rich reward to take Snow White into the forest, far away from the castle. Then, unseen, he was to put her to death. The greedy servant, attracted to the reward, agreed to do this deed, and he led the sweet little girl away. However, when they came to the fatal spot, the man's courage betrayed him and, leaving Snow White sitting beside a tree, he mumbled an excuse and ran off. Snow White was thus left all alone in the forest. At last, dawn woke the forest to the song of the birds, and Snow White too, awoke. A whole world was stirring to life and the little girl was glad to see how silly her fears had been. However, the thick trees were like a wall round her, and as she tried to find out where she was, she came upon a path. She walked along it, till she came to a clearing. There stood a strange cottage, with a tiny door, tiny windows and a tiny chimney pot. Everything about the cottage was much tinier than it ought to be. Snow White pushed the door open. "I'll make them something to eat. When they come home, they'll be glad to find a meal ready." Towards dusk, seven tiny men marched homewards singing. But when they opened the door, to their surprise they found a bowl of hot steaming soup on the table. Upstairs was Snow White, fast asleep on one of the beds. The chief dwarf prodded her gently. "You can live here and tend to the house while we're down the mine. Don't worry about your stepmother leaving you in the forest. We love you and we'll take care of you!" Snow White gratefully accepted their hospitality, and next morning the dwarfs set off for work. But they warned Snow White not to open the door to strangers. Meanwhile, the servant had returned to the castle, with the heart of a roe deer. He gave it to the cruel stepmother, telling her it belonged to Snow White, so that he could claim the reward. Highly pleased, the stepmother turned again to the magic mirror. But her hopes were dashed, for the mirror replied: "The loveliest in the land is still Snow White, who lives in the seven dwarfs' cottage, down in the forest." The stepmother was beside herself with rage. "She must die! She must die!" she screamed. Disguising herself as an old peasant woman, she put a poisoned apple with the others in her basket. Then, taking the quickest way into the forest, she crossed the swamp at the edge of the trees. She reached the bank unseen, just as Snow White stood waving goodbye to the seven dwarfs on their way to the mine. "Who's there?" she called suspiciously, remembering the dwarfs advice. "I'm an old peasant woman selling apples," came the reply. "I don't need any apples, thank you," she replied. "But they are beautiful apples and ever so juicy!" said the velvety voice from outside the door. "I'm not supposed to open the door to anyone," said the little girl, who was reluctant to disobey her friends. "And quite right too! Good girl! If you promised not to open up to strangers, then of course you can't buy. You are a good girl indeed!" Then the old woman went on. "And as a reward for being good, I'm going to make you a gift of one of my apples!" Without a further thought, Snow White opened the door just a tiny crack, to take the apple. "There! Now isn't that a nice apple?" Snow White bit into the fruit, and as she did, fell to the ground in a faint: the effect of the terrible poison left her lifeless instantly. There they found Snow White, lying still and lifeless, the poisoned apple by her side. They did their best to bring her alive, but it was of no use. Then one evening, they discovered a strange young man admiring Snow White's lovely face through the glass. After listening to the story, the Prince (for he was a prince!) made a suggestion. "If you allow me to take her to the Castle, I'll call in famous doctors to waken her from this peculiar sleep. She's so lovely I'd love to kiss her!" He did, and as though by magic, the Prince's kiss broke the spell. To everyone's astonishment, Snow White opened her eyes. She had amazingly come back to life! 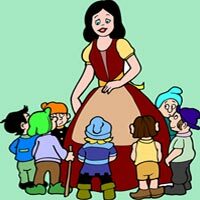 Now in love, the Prince asked Snow White to marry him, and the dwarfs reluctantly had to bid good bye to Snow White. From that day on, Snow White lived happily in a great castle. But from time to time, she was drawn back to visit the little cottage down in the forest, to her dwarf friends.